Opera positioned itself as one of the marketing leaders in web based compression software solutions with their Opera Mini web browser which utilized Internet traffic compression to reduce the load time on mobile devices. This was achieved by sending all network traffic through specifically crafted Opera servers which compressed the traffic before it was send to the client's mobile device. Opera Turbo builds up on the experience that the Opera development team gathered during the development of Opera Mini. The new service will be officially announced at the Mobile World Congress (MWC) in Barcelona. The information that can be gathered from the available whitepaper suggests a broader service that allows businesses to run Opera Turbo servers which will manage the compression for their clients. 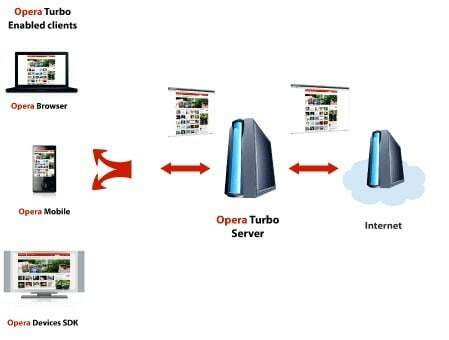 Internet traffic will be routed through Opera Turbo servers which compress it and send it to the clients. The browsers on the client side will also compress any data before it is send to the Opera Turbo server which unpacks it before it is send to the actual destination. According to the whitepaper Opera Turbo will be able to compress network traffic by up to 80%. The benefits of Opera Turbo should be obvious. The service will save businesses bandwidth, speed up web surfing for clients and reduce costs thanks to the reduced bandwidth requirements. The main Achilles' heel of Opera Turbo is the requirement to use Opera software to make use of the technique. Opera currently has a web browser market share of about 1% which means that about 99% of all Internet users will probably never be able to test Opera Turbo. Existing Opera users on the other hand might be able to benefit from Opera Turbo as Opera has the intention to utilize the technique into the Opera web browser and Opera mobile browser. Wow, this actually seems very interesting to me! Hopefully this will be a free service for home use. There problem is I’ve got a bandwidth limit of 25GB/month. So since I have a long list of sites I check daily, I mostly don’t have a lot of GBs left to download stuff. You can use Opera Mini full screen on you PC full screen. And the pages get compressed. That is wrong. It simply means that 99% of internet users will have to install a new program to enjoy the benefits. It doesn’t mean that they will be unable to. Opera runs on Mac, Linux, and even Windows so and user can install the software if he wants to. This, in contrast to Internet Explorer, which only runs on about 88% of computers (Mac: 9%, Linux: 3%), and therefore one in nine computer users _cannot_ view IE-only content. I think it is primarily meant for mobile usage and there the market share of the mini and mobile variants of opera is already way higher than 1%. And since this will be offered to mobile network providers who can preinstall software on the phones they are subsidizing this shouldn’t be a problem. For desktop it’s going to be good but not extremely important. I do have “nice” 20Mb daily traffic limit at work so I would find use for that. But surviving without such just fine. Sounds much better for netbooks/MIDs and rest of mobile stuff. So “Fox Boy” need to start their copy-writer right now LOL (just kidding). Opera was so damn good when introducing new features, and their internet suite (not only web browser, but newsreader client, bit torrent client, IRC, mail client) has done well. So what is this compression? What’s the Disadvatage? If it’s that good, why doens’t simply every server send his traffic compressed? A lot of sites don’t bother to setup compression (gzip, zlib, deflate) even if it is technically possible. Also images can’t be reduced in size without quality loss, regular sites can’t change quality/size on the fly while additional filtering services can (service fetches full image, reduces quality and serves smaller to user). I think it be very good compression, fast speed of downloading, but very expensive for a while!